Skinny Fiber and Skinny Body Max - What Is The Difference? Many of you have asked me to explain the difference between Skinny Fiber and Skinny Body Max. This article answers this question for you starting with the ingredients in each weight loss product and how they work, as well as how they are similar and different weight loss supplements. What Is The Difference Between Skinny Fiber and Skinny Body Max? Skinny Fiber is the original supplement that has been twice the voted best weight loss product, as well as recognized as one of the most popular diets of the year. Skinny Fiber has been helping people lose weight for six years to date. It consists of 3 dietary fibers (Glucomannan, Caralluma, Cha De Bugre) that aid in appetite control, metabolism and more. Skinny Fiber also includes 7 digestive enzymes to help break down carbs, protein, fat, glucose, fiber and with inflammation. Skinny Body Max is an enhanced version of Skinny Fiber. It has the same digestive enzymes , caralluma and glucomannan fiber benefits that customers love about the Skinny Fiber, but it is enhanced with additional fiber, digestive and fat burning ingredients. It is perfect for those who have hit a weight loss plateau or need a little extra help in comparison to the other product. How Are Skinny Fiber and Skinny Body Max The Same? Skinny Fiber is a product with natural ingredients and stimulant free. It is typically enough of an appetite suppressant and digestive aid for people with average weight management needs. Over the years, many customers with health issues have been able to use Skinny Fiber successfully after approval from their doctors. Skinny Body Max is an organic product and an enhanced version of the original. Both weight loss products work well for people that use them regularly and do what they personally need to lose the weight. The suggested doses of Skinny Body Max is two capsules twice a day at least 30 minutes before your 2 largest meals of the day. Both Skinny Fiber and Skinny Body Max customers have the option to take HiBurn8 in the evening 30 minutes before bed. It has numerous vitamin, mineral, skin, sleep and health benefits that contribute to 24 hour weight loss support. I personally found that the Skinny Body Max is a stronger appetite suppressant for my body, but the Skinny Fiber kept me regular if not eating as much fiber, therefore I took both as follows: One Skinny Body Max capsule with my Skinny Fiber in the morning, then a dose of the Skinny Fiber (2 capsules) in the evening. I would end the day with a serving of in the evening 30 minutes before bed. I hope this info have been helpful to you. Please do not hesitate to contact me with any questions. Contact Me with any questions. Summer is coming to an end. Schools about to begin and the cold weather will take a toll on our lives. I hope you've been taking advantage of these past few months. If not, it is not too late to start an end of summer exercise routine. Research says that exercising outdoors has numerous benefits over indoor workouts. This is true for both children and adults. 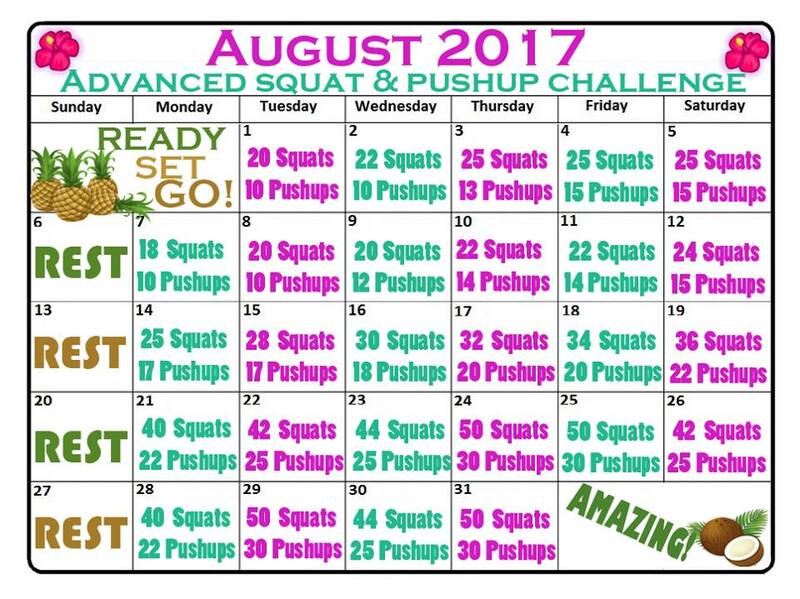 Yet, living in a tropical region or certain illnesses can make these scorching summer months feel impossible to workout in, therefore having an indoor exercise plan - like the August Fitness Challenges below - are helpful. This is especially true for those of us who can't exercise outside because of weather and other personal reasons. 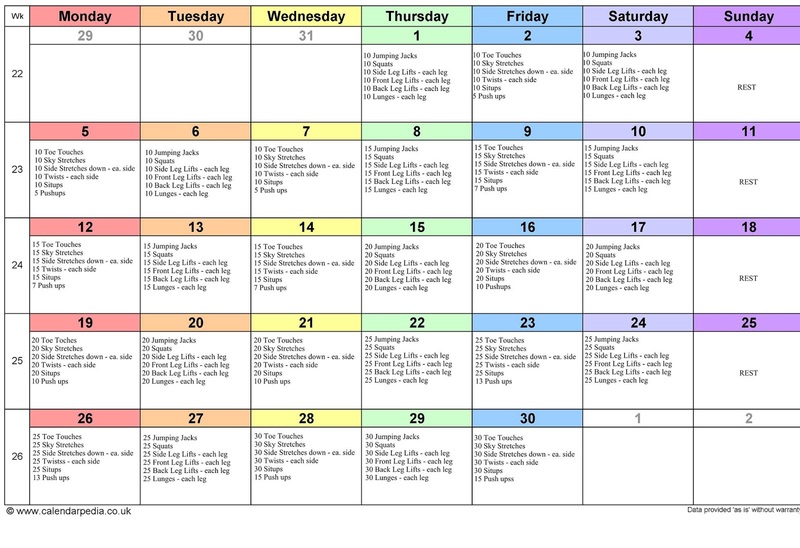 Click each calendar to enlarge and print to have on hand daily! Depending on your budget and motivation, joining a YMCA / YWCA fitness center or traditional gym can be the best option. Not only can you choose exercise options according to your interests, but you can also get support from a fitness professional in their staff. Gold's Gym and Planet Fitness are two gyms where you can get a free workout routine set up, so you know what you're doing each time you enter the gym. Gold's Gym also has classes included in their monthly membership fee. YouFit and other gyms offer free assessments, free exercise classes and reduced cost personal training sessions (small group or individual) based on your budget. Some gyms have pools, tracks, childcare and extended hours to accommodate your lifestyle needs. Memberships start at about $10 a month; some offer special plans and SilverSneakers classes for seniors. * You can attend fitness classes outside in the park or at the beach, too! Check up a website called Meetup.com or search Google for outdoor yoga, zumba, fitness classes. Whether you want to "mix it up" during the week or feel like taking advantage of good weather, some parks have outdoor exercise machines and / or trails. Here in Florida it is not uncommon to find outdoor weight machines, ellipticals, stationary bikes, calisthenics equipment, obstacle courses and unique trails. It was like that in one of my favorite parks in the north, too, so do a Google search to see if you can find a local park that lets you work out in nature. It can actually be a lot of fun for the kids, too. Walking is something that you can do anywhere; even in the comfort of your own home via Leslie Sansone videos or a treadmill. Mall Walking is an AMAZING way to stay cool and get more fit in the summer. Jogging and Running can be just as convenient depending on location and your health. 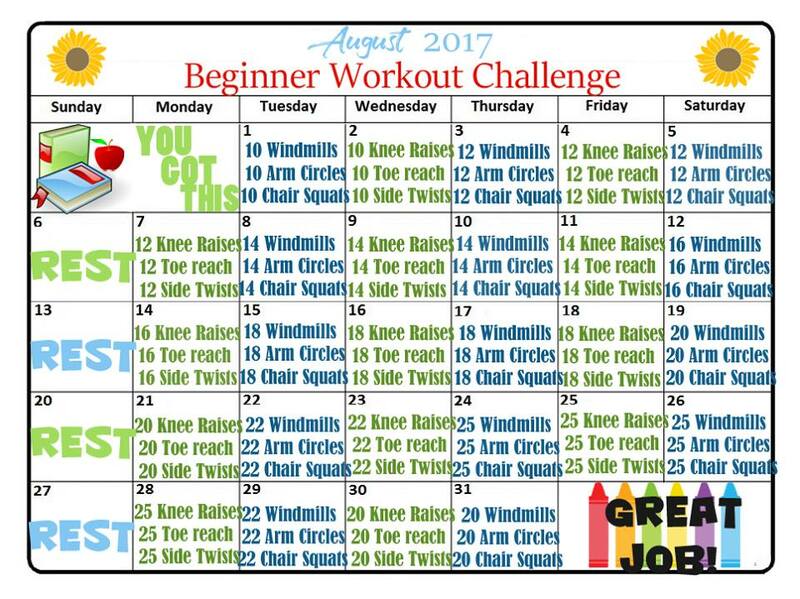 Whatever you choose, if you want the best way to add some cardio to the August Fitness Challenges above, walking or running it is the easiest! Some local recreation centers, YWCAs and parks have both indoor and outdoor pools for free swim, laps and classes. Gyms usually have indoor pools where you can swim laps or take structured classes in water aerobics, strength training or yoga. Classes are usually hosted in the shallow end for the comfort of those who cannot swim, so don't avoid if you want to try water fitness classes. Swimming is the perfect option for people that want to exercise outside in the summer. In addition to swimming, there are plenty of water sports that increase heart rate and keep you cool, too. Whether water skiing, kayaking, canoeing, surfing, parasailing, body boarding, rowing, pool fitness class, water polo, rugby, basketball and so on ... You can jump in a lake or the ocean to partake in challenging and refreshing water sports. 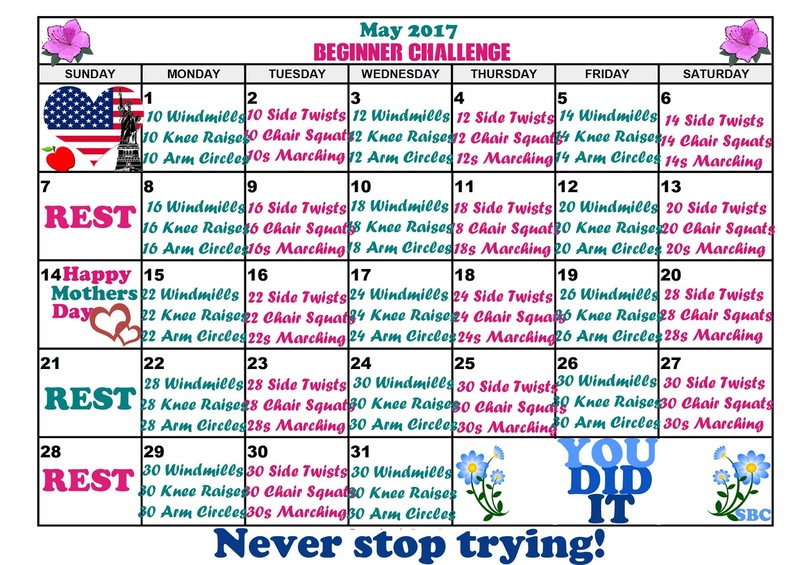 Come join our group to share what you're doing and get some motivation from our online friends! Don't forget to check out our ongoing 90 Day Challenge for weight loss support, too! 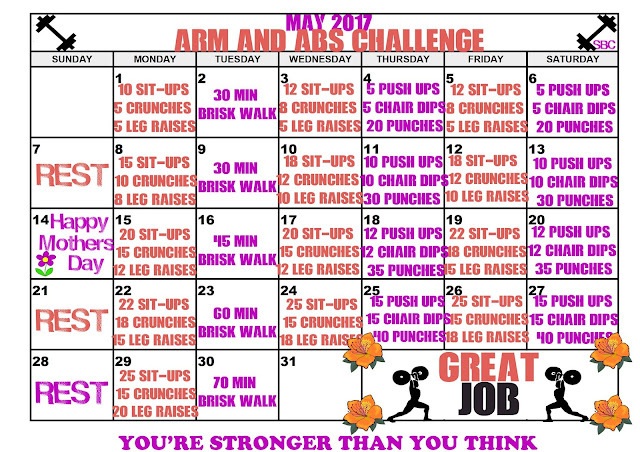 Whether you choose to just stick with the August Fitness Challenges or supplement with some of these other ideas, you still have plenty of warm weather time to get into a workout routine that can carry over into the fall season. 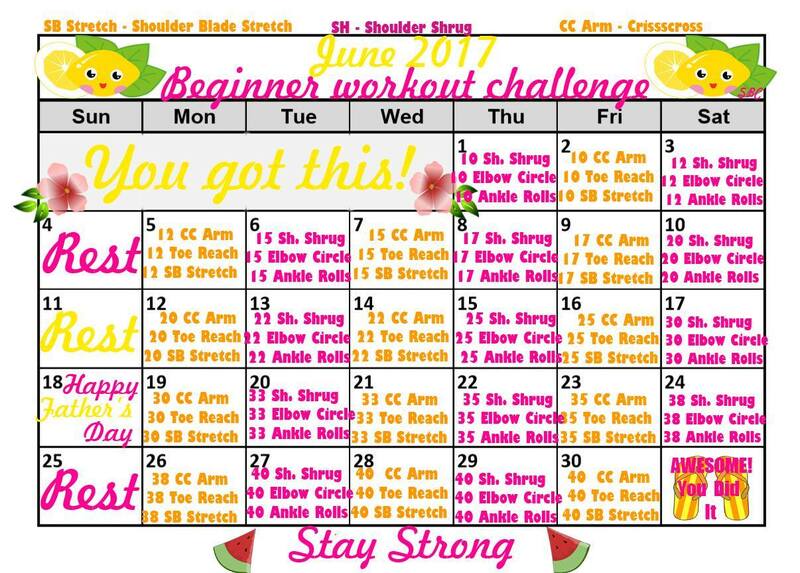 This is a quick posts with the June Fitness Calendars and some Exercise Challenges that I think you'll enjoy. Just jump right in on which day you see this post ... 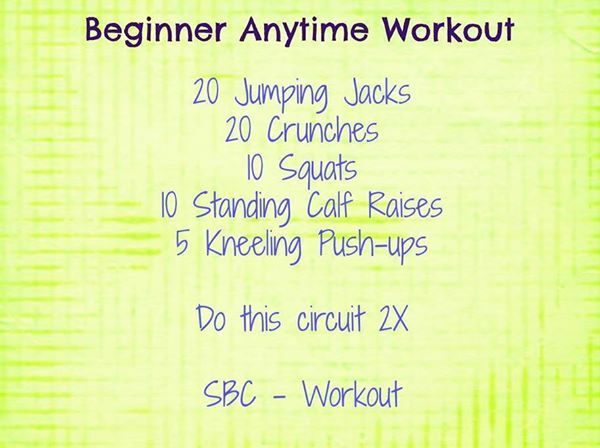 Combined whichever makes a challenging workout for you each day. Although exercise is not a requirement of the 90 Day Challenge, it is encouraged that you embrace some type of regular workout routine for your health and long term wellness. Aging is no friend to the unfit. Disease, Obesity and Atrophy are the long term risks. 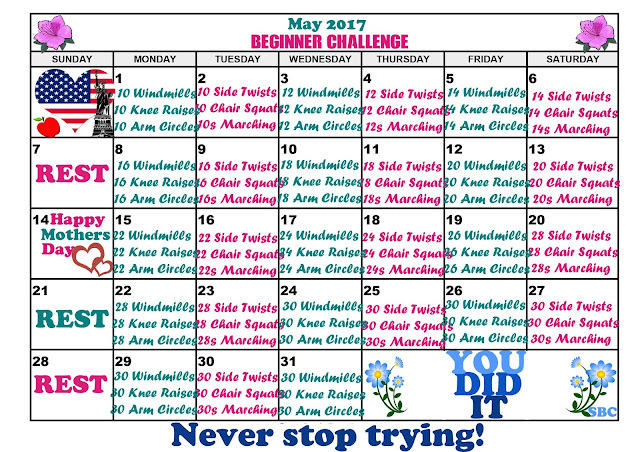 Have you been thinking about joining our weight loss challenge, but not sure how it works? Click THIS LINK to learn more and how you can participate with a full guarantee. Lose Weight, Win Prizes, Work On Long Term Health Goals. It has worked for so many people ... Why not you, too? My family loves tacos so much that they would eat them everyday if they could - LOL. Since we have them a lot, I try to make our tacos as healthy as possible by using chicken or fish and lots of veggies, but beef tacos are still their #1 choice. I personally LOVE super long Romaine Lettuce tacos or making a taco salad - YUM. 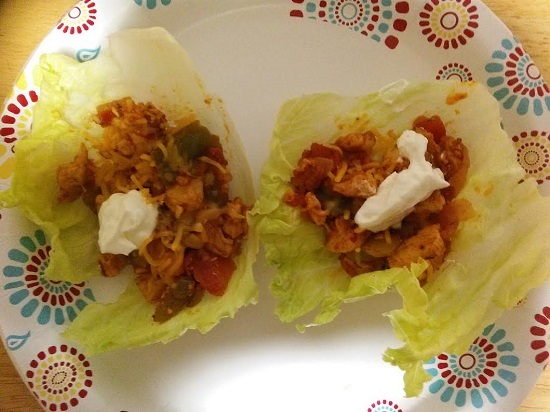 If I do "make" my family eat lettuce tacos instead of using tortillas, good old iceberg lettuce works well for everyone's taste (as you see in the picture above) especially with my homemade chicken veggie taco filling! Here is that recipe for you; I hope you enjoy! - Finely shredded cheddar cheese. Clean all vegetables well. Make sure to softly roll the Shiitake mushrooms in a paper towel to get all of the water out of them. Chop up vegetables (not to small) and set aside. Dice up chicken breasts into small pieces. Open the can of tomatoes. Heat 1 tbsp olive oil in a non stick pan and add chicken breast. Lightly sprinkle TAJÍN® Clásico Seasoning to lightly cover all chicken. Generously sprinkle garlic powder and chili powder on chicken as well. Cook a few minutes, add the green pepper and the chopped mushrooms. Cook for a few minutes and then add the onion. Stir the meat mixture well while cooking until it's almost done and then add the tomatoes. Let the moisture from the tomatoes cook down while stirring often. When it's done, spoon the chicken veggie taco mixture onto lettuce leaves. Lightly top with finely shredded cheddar cheese and dollop of plain Green yogurt or sour cream. This salad is DELICIOUS and only about 350 Calories! Bake chicken at 350 F for about 20 - 30 minutes. Mix salad veggies and other ingredients in large serving platter while the chicken is baking. Remove chicken from oven and let rest 5 minutes. Slice thin against the grain. Plate the salad, top with chicken and add a little dressing. 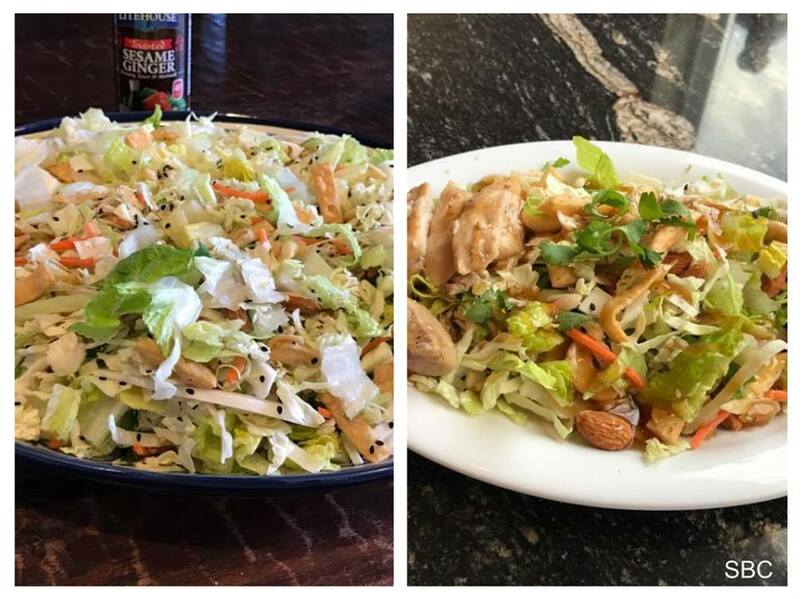 Have you tried this Chinese Chicken Salad Recipe? Have you tried this recipe or any variation of a Chinese Chicken Salad? Please share your opinion, suggestions or picture below! Weight loss comes with challenges that are so hard to beat. Hunger and Cravings are two of the most frustrating ... You know how it is! Those moments of weakness where it feels impossible to avoid indulgent treats. For example, eating on the road, candy on your coworker's desk, dessert cravings after meals, etc. Temptations are constant, therefore it's important to learn how to deal with them because bad food choices cause more cravings and hunger. Giving into temptations also causes regret in our hearts which leads to feelings of failure that make people quit trying to lose weight. 💜 I DON'T WANT THAT TO BE YOU! 💜 So, if hunger and cravings are your weakness, you can learn how to apply changes that help you lose weight naturally and not gain it back again! Like swapping out some "bad foods" choices (white rice, noodles, croutons, chips, sugar) with the following 5 foods that help control hunger, cravings and support weight loss. 5 Foods That Beat Hunger and Cravings -> If You Let Them! 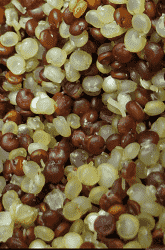 Quinoa is an ancient "grain" that has made a modern comeback because of its high nutritional value. It is cooked and eaten just like rice, but is packed with fiber and protein that helps beat hunger, Plus, it is not nearly as refined as other options like rice, noodles and grits. Quinoa is a seed that releases energy slowly into your body. This means it helps your body avoid the sudden fluctuations in blood sugars that can lead to cravings for chocolate and other diet busting snacks! Nuts get a bad rap for being high in fat and calories, but they have very useful calories from beneficial omega-3 fatty acids. These nut fats help promote healthy circulation and improved brain function. They are also stuffed with fiber and antioxidants which promote smooth digestion and stable blood sugar levels. The greatest thing about nuts is that they're so full of nutrients that just a few will go a long way. For example, 1/4 cup or a small handful of nut with low fat yogurt will provide a steady release of energy throughout the morning. Raw nuts are better for health. Berries are AMAZING for sugar cravings. They are a welcoming combo of sweetness and fiber to help beat hunger. 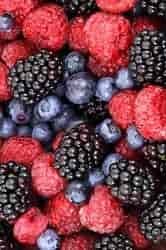 In addition to these wonderful qualities, berries are loaded with nutrients and are low in natural sugar. The form of sugar in berries - fructose - is harder for the body to break down than the highly refined glucose found in sugary snacks. This helps keep blood sugars stable while helping you avoid sudden hunger pangs. The work involved in digesting berries means less calories are converted into those troublesome fats that are usually stored around your body. 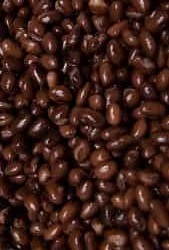 Beans are not just for vegans and vegetarians; they are a dieter's best friend for weight loss. They're tasty, versatile, filling, rich in fiber and vitamins. It doesn't matter whether you choose white or red beans, organic dried or bpa free canned, consider swapping out meat for beans in recipes for an added touch to meals (some people do this every other day for health). Beans help beat hunger and support weight loss without sacrificing any taste. They are high in carbs, so you can use them to balance out your energy needs' especially if power training. 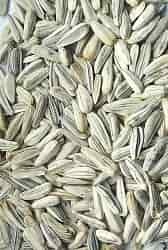 Seeds such as sesame, sunflower or pumpkin make a healthy and tasty snack. They regulate blood sugar levels efficiently as well as aid in healthy digestion and circulation. In addition to snacking, many like hemp, sunflower and sesame seeds can be added to salads to provide flavor and texture. Seed make salad dish feel much more satisfying even without meat. You can also add them to morning meals. Chia or flax seed in smoothies are delicious. Sunflower or hemp seeds give yogurt that little extra substance when you don't have berries; makes it a filling meal. These 5 foods are just a few healthy choices in addition to vegetables and lean proteins. The quinoa and beans are higher in carbs. The nuts and seeds have more fats and the berries compensate for sugar; all have fiber to help keep you full. The KEY is to watch your servings when adding any one or two of these 5 foods at meals and in consideration of what else you are serving, so you are not adding too many calories. In other words, EAT BALANCED. 1/2 cup = 111 calories in quinoa. a handful or 1/4 cup is the average for nuts, but some like brazil nuts and coconut have more fat and calories. It is suggested to eat macadamia nuts and pecans in moderations because they are the highest in fat and lowest in protein, but nutritionally valuable for other reasons. 1/2 cup to 1 cup depending on the berry. Take Skinny Fiber / Skinny Body Max While Learning How To Eat Better and Creating A Healthier Life! Although you might feel desperate to lose weight and it is true that you can take our weight loss products for years while not changing a thing, YOUR HEALTH IS STILL IMPORTANT. It is better to work on establishing healthy life changes while taking Skinny Fiber or Skinny Body Max, than to harbor the same old bad habits that made you overweight. You can have even better control of the hunger and cravings that made you cheat and fail at weight loss in the past. You can actually lose weight and keep it off for good!!! Hope you found this article helpful. lease make sure to comment below or email to let me know. SUBSCRIBE here if you haven't already and LIKE our Facebook page, so you can get more Skinny Fiber Weight Loss Support! The science of weight loss is supposed to be easy. Calories In (what you eat) vs Calories Burned (activity) is what works for most of us, as long as we stay committed. Lack of commitment is one of the major reasons why so many people struggle to lose weight regardless of eating plan and exercise routine. They don't stick with the time and effort needed because they want instant results and fast weight loss. 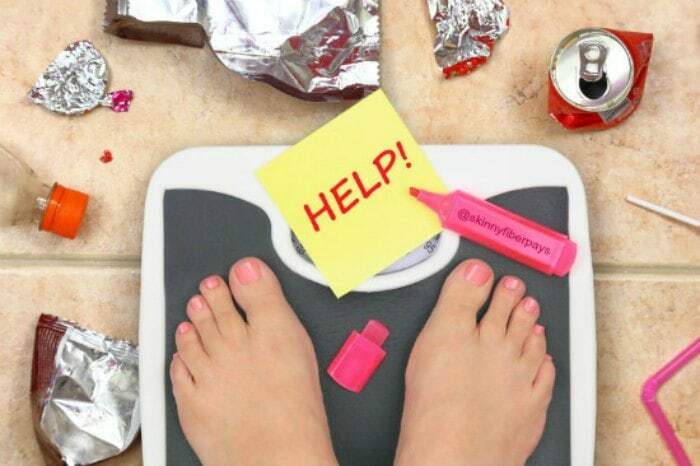 IF THIS IS YOU ... jump back on the bandwagon and keep trying to lose weight. Slow and steady is not failure; health experts confirm that just 1 to 2 pounds a week is the goal. On the other hand, if you've been failing to lose weight consistently or failing to lose weight at all, it feels like there's no reason to go on. You may have even experienced weight gain as your body adjusts or because of yo yo dieting. If this is you, here are the top 8 reasons why you're not losing weight (split into 2 categories) and suggestions for the problems. You might be tired of hearing these first 3 tips, but they REALLY are major reasons why you are not losing weight and won't keep the weight off long term. If you buy foods that say "low fat", "healthy", "made with real fruit", "all natural", "multigrain", "sugar free", "no sugar added", and so on, it is very likely that you are being tricked by the manufacturers because they replace what is supposedly removed with other unhealthy ingredients to balance the flavor and make us more addicted to the "bad foods". Sometimes you have to watch the "organic" labels to make sure the non-GMO and USDA Organic labels are there, too. The goal is to eat real whole foods that include fresh vegetables and fruits, lean meats and seafood, sprouted whole grains and nuts, as well as low sugar dairy products like yogurt and cheese. Many people count the calories in food, but forget to include calories from drinks. One small glass of juice or can of cola can contain as many calories as a packet of crisps, chips or small chocolate bar. Sugary drinks have been linked to obesity and other health problems, making them a self sabotaging choice for most people, particularly when trying to lose weight. 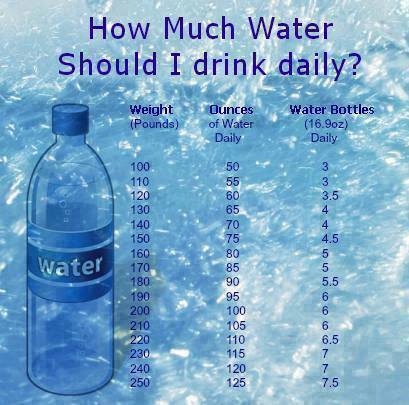 Drinking more water, green tea and occasional black coffee can help. You can add stevia to tea and coffee for sweetness instead of sugar. A lot of people ask if they can add flavor drops to their water or drink crystal light because they hate to drink water. Again, drinking calories, as well as chemical foods, have their disadvantages to weight loss and health. It is better to drink lemon water or other infused water recipes. The rule of thumb with healthy lifestyle changes and weight loss is to avoid foods that come packaged and with added chemicals. As mentioned above, it takes time and effort to lose weight. The commitment must be there in order to accomplish your weight loss goals. If you are not losing weight because of inconsistency and lack of self control, then maybe you should start with looking in the mirror and equating it with SELF LOVE. Examples of sticking to what you need to do to lose weight and need to make healthy lifestyle changes include Meal Planning, Portion Control / Calorie Counting, Exercise Schedule, Sleep Schedule, Stress Control and Personal Time for reflection, hygiene, doctor, dentist, not smoking, personal care ... Taking the time to care about yourself in all areas of life is part of the self control you need. This is self love and as long as you stick with it you can accomplish long term weight loss goals and live a genuinely healthy lifestyle. There are several reasons why you're struggling with weight loss and they may not all be your fault, though some are correctable. Some medical conditions can make it difficult to lose weight and, in some cases, even cause weight gain. Hormone imbalances, hypothyroidism (underactive thyroid) and PCOS (polycystic ovary syndrome) are among the most common health problems leading to weight gain. Medication is another common reason for difficulties when losing weight. Contraceptive pills, insulin, corticosteroids and several other medications can cause weight gain and fluid retention. Switching to a different treatment or making a few lifestyle modifications can help in most cases. Dieters often hit a plateau after the initial weight loss. This plateau is usually triggered when the body becomes used to a lower calorie intake and responds by conserving fat stores. To push through the plateau, try varying your calorie intake every day. If you are restricting the amount of food you eat, it's important to have a break and eat normal portions at least once a week. 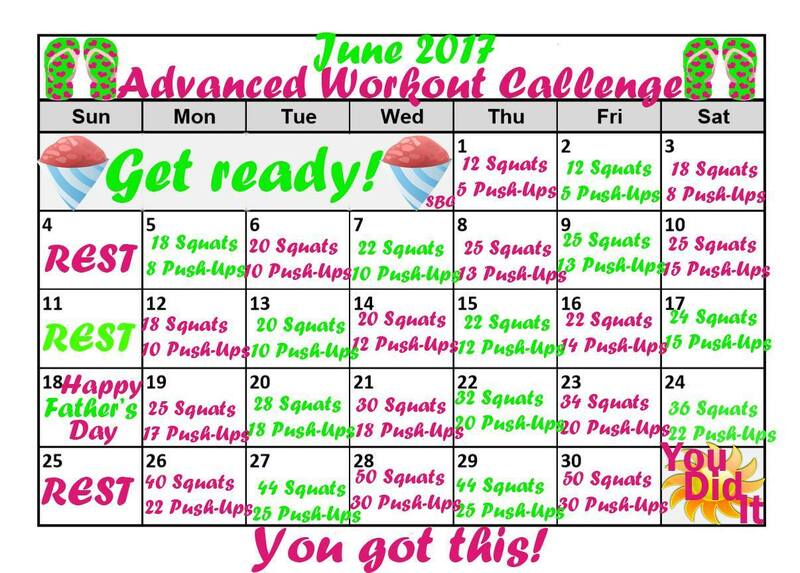 Come add me as a friend @ http://www.facebook.com/flwahm and then send me a message to join our group for support and tips on how to get through a weight loss plateau. Studies have shown that lack of sleep, poor quality sleep and tension can all make it more difficult to lose weight. Learning to relax and getting a good night's sleep can make a big difference to weight loss efforts. Meditation, mindfulness, visualization and relaxation exercises can all aid restful sleep. If you need a little more help, HiBurn8 is loaded with vitamins, minerals, weight loss ingredients and helps with sleep. When starting a new exercise routine for weight loss, many people concentrate on cardio workouts like walking, running, elliptical and aerobics - which is AWESOME - but, developing new muscle tissue is just as important, if not more, even if you may notice an initial increase in weight. The weight gain is only temporary and the extra muscle will help to burn fat more effectively. The goal is to build muscle and burn fat; both, not one or the other. You can find videos for weight training at your level or you can join a gym and use the circuit machines to build muscle, as well as enjoy classes and utilize the cardio exercise machines. Not Losing Weight & Need Help? Weight loss can stall for a variety of reasons and most people experience a temporary plateau after a few weeks of steady weight loss. If you are unable to lose weight, despite eating a healthy diet and taking regular exercise, ask your doctor for advice. Hope this post has helped you gain perspective on whether you have roadblocks to clear so that you can start losing weight and feeling your best again. Please let me know what you think in the comments section below!